I can’t tell you exactly where personal style comes from, but when you’ve got it flaunt it! One of the best parts of my job is to uncover my clients taste and transform it into 3D. Every design “like” and “dislike” is considered to develop each clients unique space. Because who wants their home to look exactly like everyone else? Do we value individual expression? It’s the difference between eating at a boutique restaurant verses a chain, one is memorable and the other is not. Why not create a memorable home? A very sweet and well traveled client is ready to do just that. 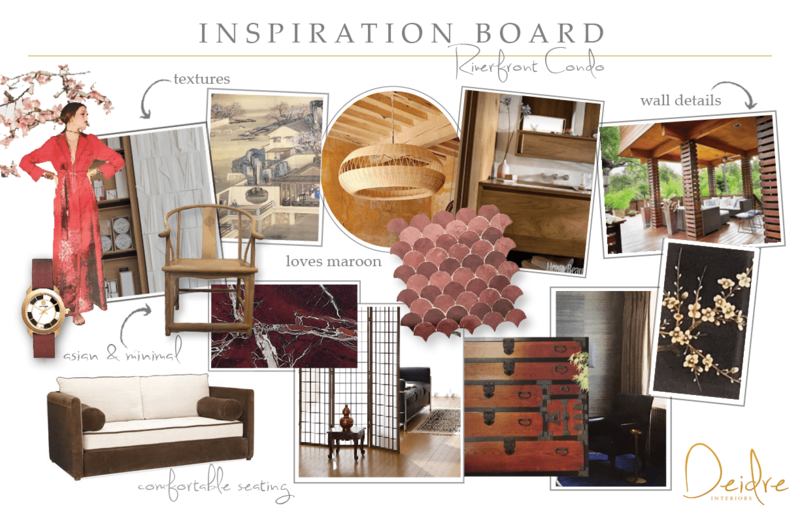 This thoughtful client reached out to me last summer about transforming her dated sky rise condo into a modern/textural/Japanese inspired home. Below are some of the images we shared to develop her style! Rich wood tones, maroon red, and cherry blossom prints are all favorite details. During this project we will be opening up the kitchen to the main living space, so dust will fly and walls are coming down! Here is the floor plan as it is right now. The kitchen, bathrooms, entry and flooring through out are all being redone. It’s going from 1980’s tired to Japanese inspired, woo hoo! Can’t wait to share more as the project progresses. I love writing and sharing with you guys, thank you for reading! Is your home designed to be memorable, to you?